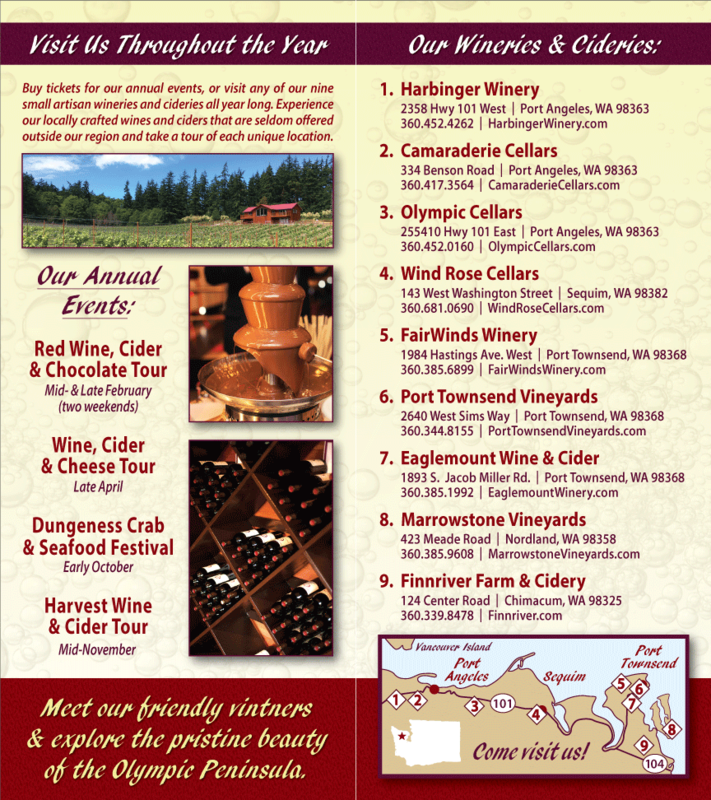 Olympic Peninsula Wine and Cheese Tour (and cider too)! Experience the finest locally made artisan cheeses paired together with handcrafted wine & cider during Olympic Peninsula Wineries’ 2019 Wine, Cider and Cheese Tour on April 27 & 28. This extraordinary experience will take you through a self-guided tour of our nine award-winning wineries and cideries here on the Olympic Peninsula. This popular spring wine tour features many newly released wines along with old favorites paired with cheeses specially selected from local creameries as well as cheeses around the world. Tickets are available online for $40 or $45 at the wineries and cideries and are non-refundable. These tickets include a souvenir wine glass, wine and cider tastings at each winery as well as the associated cheese pairings. Visitors who get their ticket stamped at all nine locations will be entered in a drawing for a wine and cheese themed gift basket. Purchase your tickets here! Each tasting room will be open from 11:00 a.m. to 5:00 p.m. each day and some venues may have extended hours for non-tour visits. Tasting fees for those not participating in the ticketed event will be $10 per person at each winery or cidery. The Olympic Peninsula Wineries encourage responsible wine touring and recommend that you have a designated driver in your group. Designated drivers do not need to purchase a ticket and are always welcome to sample the food. While children are allowed in the tasting rooms, you must be 21 or over to purchase tickets and/or participate in wine and cider tasting. Each participating winery and cidery on our Olympic Peninsula Wine and Cheese Tour has something unique and special to offer you and everyone in your party. You can choose to visit all nine participating locations or choose only a few. Here is a preview of what they will be offering. Check back as not all the wineries and cideries are listed yet! 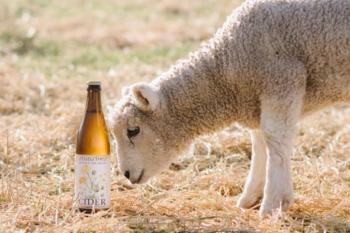 Finnriver Farm & Cidery is eager to celebrate the Spring with seasonal cider and fruit wine releases and a new spring cheese from our friends at Mt. Townsend Creamery. Come taste life on the land with our botanical Honey Meadow Cider and our 2018 Harvest releases of our classic Farmstead Cider and our complex and subtle Perry. Special tastings of our Liberry Wine made with locally harvested organic red currants from Tahlequa Farms and sold as a fundraiser for the Friends of the Jefferson County Library. Round out the tasting with our oak-aged Pommeau. Along the way, Mt Townsend showcases their ‘cheese with a sense of place’ and highlights their new Allium cheese, with shallots and chives. Finnriver has live music Saturdays 6-9 pm and Sundays 2-5 pm every weekend and offers seasonally inspired local food and weekend food vendors: Dented Buoy woodfired pizza, Hama Hama oysters & seafood and traditional crepes from La Crêpe de Quimper. We hope to fill your cups literally and metaphorically with our love of the land! Harbinger Winery will be hosting an array of artisan cheeses produced in the Pacific Northwest and beyond for the 2019 Northwest Wine, Cider & Cheese Festival. Discover how the crisp and fruit-forward flavors of our off-dry Riesling can bring out the best in humanity. And what about tasting the supersonic 2012 Sangiovese with a beautifully aged hard cheese that has spent more time in the dark than our cellar master? Or be seduced by the intoxicating properties of the northwest-grown Blackberry Bliss paired in a way that will make you rethink the direction of a late-night snack. While these are but a few of the pairings you’ll encounter at Harbinger Winery, be assured that there’s always a surprise or two waiting to be unveiled. All the wines and cheeses being sampled will be available for sale in the Harbinger tasting room. FairWinds Winery will be offering cheese from around the world pared with our award-winning Port O’Call, Cabernet Sauvignon, Gewürztraminer and other fine wines. Come play corn hole and win big discounts! Spring is in the air and you will find so much to be happy about at FairWinds! We will be releasing some new wines during the NW Wine and Cheese Tour. We plan to pour 2018 Pinot Grigio, 2017 Sauvignon Blanc “The Keeper”, 2014 Field Blend, 2015 Dolcetto and our 2018 Muscato. We will also have select wines on sale 50% off. We will be pairing our delicious hand-crafted wines with the robust cheeses from Black Sheep creamery, a small artisan creamery in Chehalis. 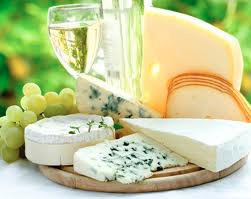 Wine has a great friend in cheese. Friday and Saturday night, we have live music from 7-9 pm. We will also feature Black Sheep Creamery on our cheese plates for the weekend. Here at Eaglemount Winery|Cidery, we are relishing the arrival of spring and the life giving sun that brings fresh buds in bloom and the promise of new beginnings across the land. We invite you to join us as we welcome the return of our unique and refreshing Ginger Peach cider; made with a blend of peach, ginger and heirloom apple varieties and the seasonal release of our full bodied Raptor and Tempranillo wines along with new vintages of your favorite organic ciders and meads. Get to know and love Eaglemount for the first time or all over again as you sit and sip on our pastoral tasting room deck where we will be offering suggested pairings of Poulsbo’s Crimson Cove smoked cheeses and a mix of MT Townsend Creamery’s new release and cherished favorites. We look forward to sharing what’s new and happening here at Eaglemount in 2019 and offering you a place that harkens back to a simpler time, a place to Taste-Stay & Play! 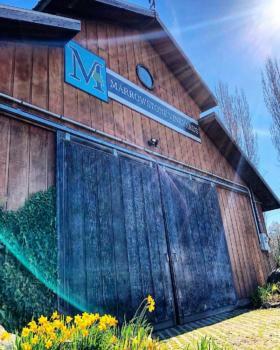 Marrowstone Vineyards will be featuring an assortment of local Che’vre from our neighbors at Mystery Bay Farm, and a five cheese gourmet pasta dish to tickle your taste buds for the 2019 Wine, Cider and Cheese Festival. We will be releasing our 2018 white wines, which pair perfectly with cheese of any kind. Discover our Sauvignon Blanc with citrus flavors, and a crisp clean acid driven finish. Then try our new Viognier, with intense flavors of tropical fruit and pear! So Delicious! We will also be offering a naked Chardonnay, Dry Riesling along with two brand new Rose’ wines. Of course we will have our stellar outstanding Reds on hand as well. All of our wine and the Che’vre will be available for purchase in the tasting room. Come sit on the deck, and enjoy the wine and beauty Marrowstone Vineyards has to offer. 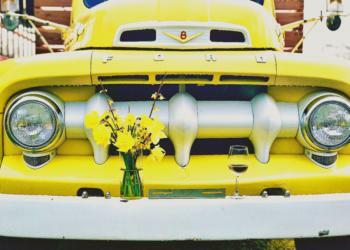 After a long winter, we’re eager to look forward to a spring and summer full of events, wine releases, and celebrations. 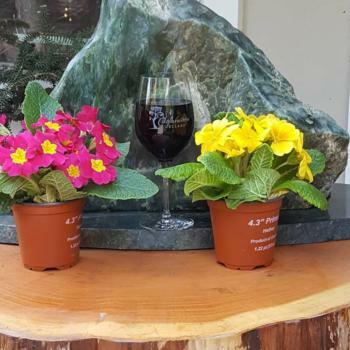 We’re getting started with the Olympic Peninsula Wine and Cheese Festival Saturday and Sunday April 27th and 28th! We’re partnering with Chimacum Valley Dairy to highlight the bold flavors of their handmade goat cheese with our food-friendly 2017 Sangiovese, 2018 Pinot Gris, and Discovery White. Cheers to spring in our sun-filled pavilion and enjoy the sounds of live music throughout the weekend. Olympic Cellars welcomes you to visit and enjoy some lovely, small batch, all-natural cheeses from Golden Glen Creamery. Expect their traditionally flavored cheddars and yummy cheese curds. All cheese will be available for purchase. For wines, will be featuring our lightly oaked Chardonnay. This fresh tasting wine pairs beautifully with many cheeses due to its nicely balanced acidity. Dungeness Red, and our 40th Anniversary commemorative label Pinot Noir will also be available for sampling along with 7 other wines. At Olympic Cellars you choose the 5 wines you taste out of 10 available. Spring is here at Camaraderie—bulbs are blooming and trees are budding and the birds are singing happily. It is also the time of year for lots of wine competition entries, which we are sending out. For the Wine, Cider and Cheese tour, we will feature some wines that have recently won great awards and accolades: you might find a Sangiovese, Tempranillo, Reserve Cabernet Sauvignon, and Elegance (a Bordeaux-style blend.) We are pleased to introduce our creamery, Appel Farms based in Ferndale. The tasting may include Gouda, Havarti, Cheddar or some other unusual notes. When you find one you like, packages will be available for purchase on site. There will be some other tasty cheese bites that include blue cheese cookies and a cheese tortellini. Is your mouth watering? Come taste and see. Tickets for the 2019 Wine, Cider & Cheese Tour are available now!